Space shuttle commander Mark Kelly shows his "Peace, Love, Gabby" blue rubber bracelet, which he wears to honor his wife, wounded Congresswoman Gabrielle Giffords. Kelly, in blue, is floating in the International Space Station with his fellow NASA astronauts, form left, Ron Garan, Mike Fincke, Drew Feustel, and Greg. H. Johnson. His crewmates have also been wearing the bracelets during their STS-134 mission. This story was updated at 12:06 p.m. EDT. HOUSTON — Space shuttle commander Mark Kelly said his wife, Congresswoman Gabrielle Giffords, is doing great after undergoing brain surgery yesterday while Kelly was flying 220 miles above the Earth. Kelly is at the International Space Station, midway through a 16-day mission on the space shuttle Endeavour. Meanwhile, Giffords, D-Ariz., has been recovering from a bullet wound to the head that she received during an assassination attempt in January. On Wednesday (May 18), Giffords underwent cranioplasty surgery to replace a portion of her skull that was removed with a plastic implant. "She's doing really well," Kelly said Thursday (May 19) during a live question and answer session with the public that was co-hosted by the PBS NewsHour, Google and YouTube. "Everything went as planned. Her neurosurgeons are really happy." "Mark has always said that he wanted her care to be at the optimal time and not to be around his shuttle schedule," Dr. Dong Kim, director of the Mischer Neuroscience Institute at Memorial Hermann-TMC, where Giffords underwent surgery, told reporters Thursday. "I just felt this was the right time to do the procedure and that's why we did it." Kelly confirmed that he didn't want his own schedule to play a role in the timing of the operation. "Obviously this has been a long road since Jan 8th for us," Kelly said, referring to the date of her shooting. "Her having surgery yesterday was not planned all along, but she was ready and the doctors wanted to do it then, and it didn’t make sense to wait a couple weeks 'till I got back." Dr. Kim said overall, Giffords has made tremendous progress in recovering from her injury. It's too soon, though, to say how far, ultimately, she will recover, or whether she'll be able to return to politics. "We can't predict exactly how much progress she's going to make," Dr. Kim said. "She has done very well so far and we hope that that progress continues." Dr. Gerard Francisco, chief medical officer at TIRR Memorial Hermann, who oversees Giffords' rehabilitation therapy, said she is extremely dedicated to working on her rehabilitation, and often presses on even when she is tired or in pain. She's also recovering much of her personality, he said. "We're having more meaningful and fun conversations," Francisco said. "She's made some jokes, we've had very good social conversations as well." Meanwhile, up in space, Kelly said he was able to focus on his complicated tasks in orbit while also receiving updates about how events were progressing on the ground. "I had a chance at the end of the day to call her mom and her chief of staff and my brother periodically," Kelly said. "I've been thinking a little bit about that, but it's a pretty common surgery and it went well." Another way Kelly stays connected to Giffords while in space is through a few choice mementos. He displayed a chain around his neck where he wears Giffords' wedding ring (she has his on the ground with her). Kelly and his five crewmates also wear blue rubber bracelets with a peace sign, a heart, and the word "Gabby" on them. 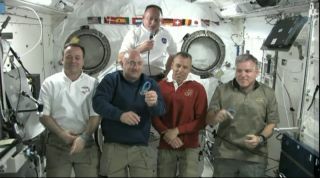 The astronauts each displayed their bracelets during the live Q&A, spinning them around in the weightlessness of space. "This is my peace-love-Gabby bracelet," Kelly said. In addition to talking about Giffords, he and the other astronauts answered some questions about life in orbit. In response to being asked what he liked best about being in space, Endeavour mission specialist Mike Fincke said, "My favorite thing about being in space is flying. Yesterday we opened up the hatch to the International Space Station, and I could really stretch my legs and fly from one end to the other. I also really like looking at our beautiful planet — it's the most beautiful planet in the whole solar system." Another question relayed by moderator Miles O'Brien was, what is it like to see the devastation of the flooding along the Mississippi River from space? "Miles, that's an interesting question, because we do have a sense of isolation being up here, living off the planet," said space station flight engineer Ron Garan of NASA. "But at the same time, we have the ability to be more connected with things on the ground because we fly over it all the time. Seeing with our own eyes the devastation and the tragedy that's going on in that area of the country is really something, and we feel a responsibility to try to document that as best we can as time allows, and take as many pictures of that area as we can." Endeavour launched May 16 on its final mission before being retired to a museum. The space shuttle is scheduled to land June 1 after delivering an astrophysics experiment and a load of extra hardware to the space station. You can follow SPACE.com senior writer Clara Moskowitz on Twitter @ClaraMoskowitz. Visit SPACE.com for complete coverage of Endeavour's final mission STS-134 or follow us @Spacedotcom and on Facebook.